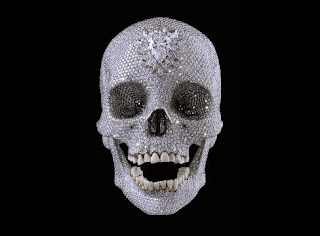 An extra treat during our visit of the Rijksmuseum was the opportunity to stand in line for 20 minutes to see Damian Hirst's For the Love of God, a platinum skull embedded with 8,601 diamonds and a set of real human teeth. It sold for $50 million. According to the museum flyer, the piece's title came from Hirst's mother. It's what she said when her son told her what he was making. We were allowed into the exhibit in small groups. You wound your way through a narrow pitch-black hallway into a pitch-black exhibit hall. The skull, displayed in a glass case, was illuminated by spotlights. You were naturally drawn to the skull because to do otherwise would mean crashing around in the dark next to God-knows-who. The skull was sparkly. The next room contained Hirst's personal selection of works from the Rijksmuseum, a mix of portraits and still lifes, each with a paragraph of Hirst's loopy commentary. There was something definitely bizarre about standing in the shadow of Dutch burghers as we snaked our way in to see a diamond skull. I imagine these businessmen of some four centuries ago with their eyes upon us calculating how many slaves they'd have to move to snag a bauble like that. It sure was a better fit than Hirst's A Thousand Years, a glass cube with maggots, flies and bloody cow's head, which I think anyone from 1635 is going to see as a waste of good head cheese.